It's October at Pretend City and the city and it's "crawling" with exciting things to do. and frightful farm shed to find the squirmy bugs and reptiles. There is a special activity each day of the week throughout the month. 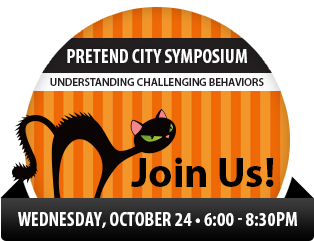 Monday, October 15: Baby Steps through Pretend City! Specifically for: Infant (0-18 months), Grown-ups. For the comfort of our infant guests, no older siblings please. Who doesn’t love carving pumpkins for Halloween? Families will have the opportunity to learn to carve pumpkins like a pro! Visit Pretend City to learn specialized tips and tricks from the pumpkin carving master, Jim Morey of VIP Carvings. Our Pumpkin Carving Workshop includes all of the supplies needed along with a pumpkin to take home! With the tricks learned the workshop, and a little bit of patience, this year you will be wowing your friends and neighbors with your awesome looking pumpkin carvings! Little ghouls and boys will have a howling good time at our Halloween Bug Bash! There’s something for every little trick-or-treater – two-legs and all! Come dressed to thrill in our creepy, creaky, critter city. Creep and crawl your way through the city as you Trick-or-Treat at each of our exhibit spaces every 2 hours. This party is bound to start off with a scream! Specifically for: Parents, caregivers, early childhood educators, healthcare professionals in the pediatric field. For the comfort of our guests, no children please. Why do challenging behaviors occur? Children often use challenging behaviors when they lack more appropriate behaviors or skills to accomplish the same goal or to communicate the message. Join our panel of experts as they share ways to understand challenging behaviors and offer helpful tips to address these behaviors. Each panelist will discuss an age range of challenging behaviors for children from birth to 10 years of age. Professional growth hours will be offered.